Are you the patient, caregiver or sibling of patient? 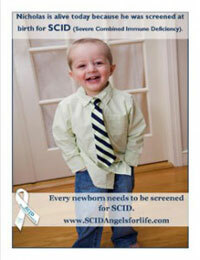 If you have more than one child with SCID, please fill out one form per child. Thank you. What State or Providence did you live in during your first treatment? What type of SCID does your child have (i.e. X-linked, ADA, Unknown, etc.)? What month and year did your child receive his/her first treatment (BMT, GT, ADA) for SCID? If your child had a BMT/GT, what type did they have (Sibling HLA Matched Donor, Haploidentical Family Match, Matched Unrelated Donor (MUD), Cord Blood, or Autologous (self/Gene Therapy)? Did your child receive pre-conditioning before his/her first treatment (i.e. chemotherapy, ATG) and if so, what type (if you don't remember the name, just put "don't know")? At what hospital did your child receive his/her first treatment (BMT, GT, Thymus transplant)? At what age was the first treatment done? Did your child survive treatment? Were you ever told or lead to believe that the first treatment your child received would last a lifetime (please explain your answer)? Were you ever told that your child has been "cured" and if yes, by whom (Immunologist, Transplanter, Pediatrician etc.)? Have you been told for how long your child will have to be followed by an Immunologist or the BMT team?